When you have missing teeth, you might go through phases. In the beginning you might not feel so bad—it’s only one missing tooth, right? But as more teeth begin to fall out and you struggle with simple eating and speaking, it can be really difficult to imagine living without a complete smile. Thankfully, you don’t have to! Your dentist offers a great way to restore lost teeth with dental implants in Kaukauna. Learn more about why patients have chosen to invest in their smile with dental implant placement in this week’s blog post. Why are Dental Implants Worth the Investment? When you think of the different restorative services that are available for people to replace damaged or missing teeth, you might not feel so confident. After all, these replacement teeth are only good for so long. 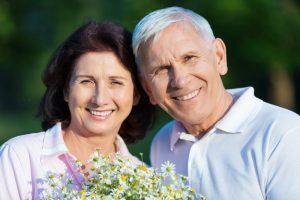 Among longevity, there are many other reasons why patients choose dental implants over other traditional options like dentures and bridges. Here are 3 reasons why people choose dental implants. 1. You can enjoy your favorite foods without worry. If you have a denture, there’s always the paranoia of slippage in the back of your mind. Dentures are made to sit on top of your gums and replace the visual part of your teeth, but dental implants are created to be more secure. Since dental implant posts are literally inserted into your jawbone and fuse with your body through osseointegration, you’ll feel like you have your natural teeth again. This means no slippage problems or issues eating your favorite foods like a juicy steak or chewing bubblegum. 2. You can keep your youthful appearance. Sometimes, dentures can make you look older than you actually are. This is again because they sit on top of the jaw, rather than be stabilizing the jawbone. Dental implants are placed within the jaw, which nurtures the jaws health. Natural tooth roots do that by pumping blood from the teeth to the jaw and around the mouth. When tooth roots are replaced with implant posts, they still take the spot of the roots and keep your whole mouth healthy as well as the keeping your remaining natural teeth in place. 3. Dental implants last the longest of all restorative options. If you’re looking into a variety of restorative options, you’ll learn that dental implants offer the most permanent solution. Since implants work to replace both parts of the tooth—above and below the gum line—they look and feel like natural teeth! If you’re interested in getting dental implants, the first step you must take is visiting your dentist in Kaukauna for a consultation. Here at Dental Expressions, we believe everyone should have a complete smile. Even if you’ve suffered from tooth loss in the past, we have the tools, resources, and expertise that you need to repair a damaged smile. Learn more about how we can help you by giving our local office a call.